Welcome to our 125 years celebration of the BERNINA company! We’re celebrating by bringing you lots of inspiration and focusing on the technique of machine appliqué and the chance to win a great appliqué prize package. Scroll down to the bottom of the post to find out more about the giveaway! What is the technique we call appliqué? The word “appliqué” comes from the French “appliquer” which means to apply or to fit over. The basic appliqué technique involves stitching a smaller piece of fabric or decoration to a larger piece to create a design or pattern. Fabric pieces can be stitched by hand or machine, with raw edges turned under or covered with decorative stitching. 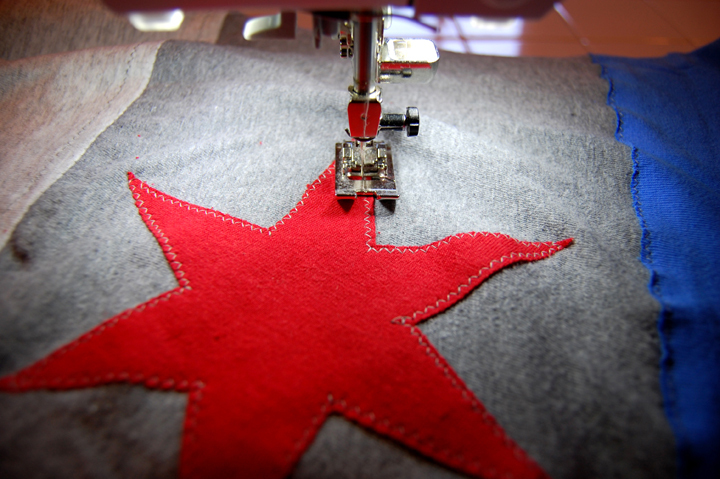 Appliqué fabric pieces can be placed directly on top of another piece of fabric, or can be held in place with glue. This technique can be used to add decorative elements to clothing, bags, pillows, banners, wall hangings, and quilts. You can use your sewing machine to secure smaller pieces of appliqué fabric and add a clean finish to edges at the same time, it’s easy if you follow these tips and techniques. If you’re new to machine appliqué techniques, this free BERNINA eBook is perfect for you! Read all about basic techniques and tools to create successful machine appliqué in the Machine Appliqué Just Sew It! eBook. Learn how to create virtually invisible appliqué stitches with your sewing machine with the Machine Appliqué Tutorial. With this special technique you might swear these appliqué shapes were stitched by hand! Making a precisely stitched circle appliqué is a snap with the BERNINA Circular embroidery attachment #83. 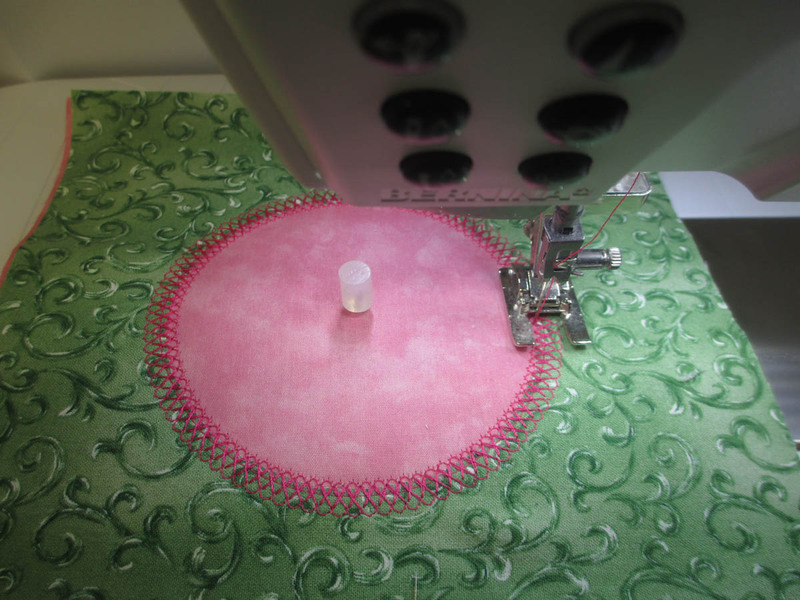 This tip includes all the steps you need to follow to Machine Appliqué Circles. Using the appliqué method you can create realistic looking pictures in fabrics from photographs. See exactly How to Create a Fabric Collage with Appliqué in this tutorial. 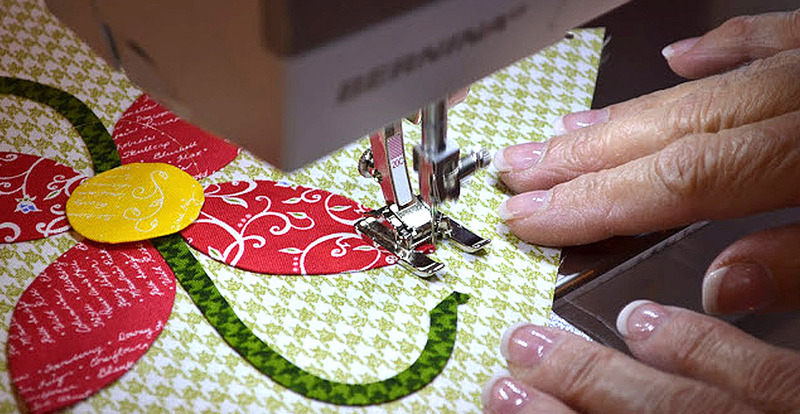 This tip is invaluable when building up appliqué shapes with smaller pieces of fabric to keep little pieces in line. Find the Appliqué Tip here. If you want to appliqué specific shapes with knits and still have the fabric remain flexible, check out this T-Shirt Appliqué Tip using Aquamesh Plus stabilizer. You know what they say, use the right tool for the job! 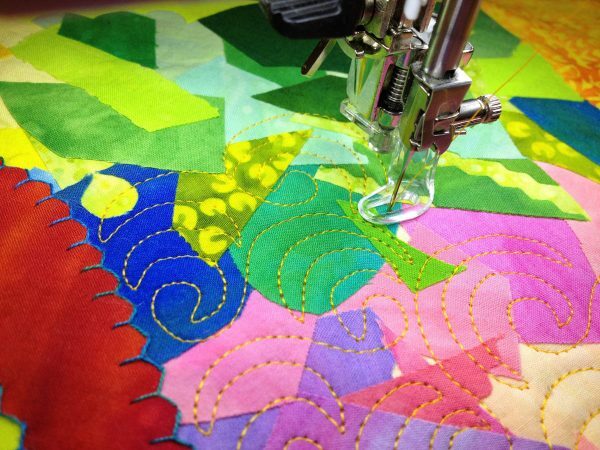 Learn how Appliqué foot #23 is specially engineered to make your appliqué stitches precise in this video tutorial. Another favorite foot for securing appliqué shapes with the free-motion stitching technique is Quilting foot #29. 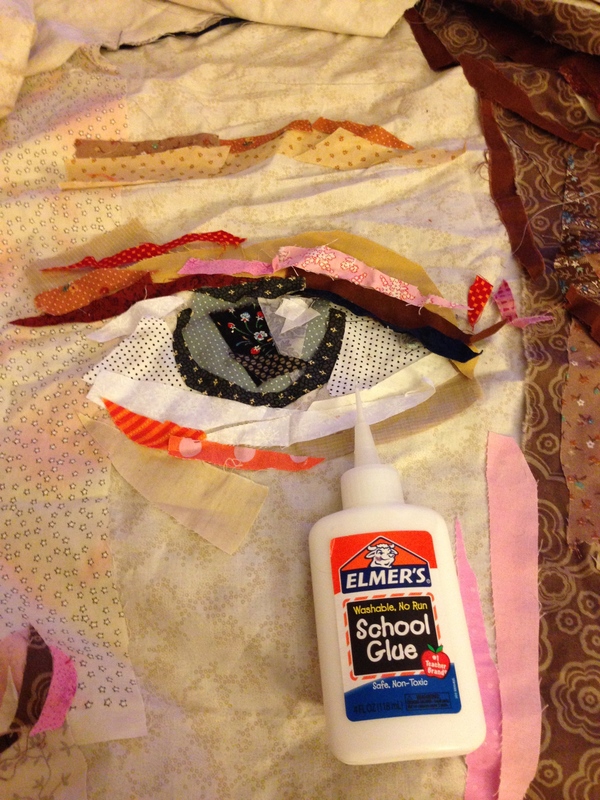 See how this method can be used in the Best Sewing Foot for Fused Collages tip. If you use fusible webbing (iron on double-sided glue) to hold your appliqué pieces down, you want to use the right needle. 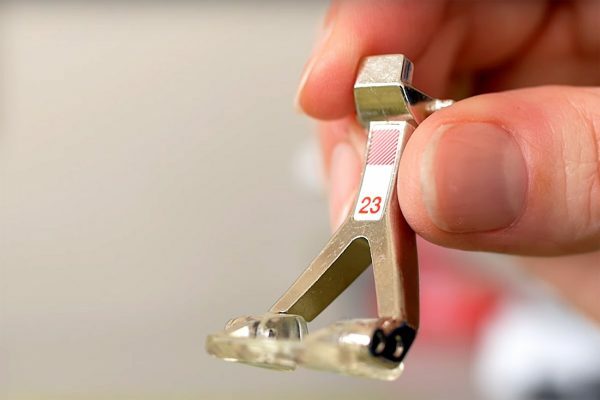 Read up on this Needle Tip for Fused Appliqué here. If you’re working with small pre-cut appliqué shapes and need to hold them in place for stitching, you’ll love this Appliqué Technique tip! 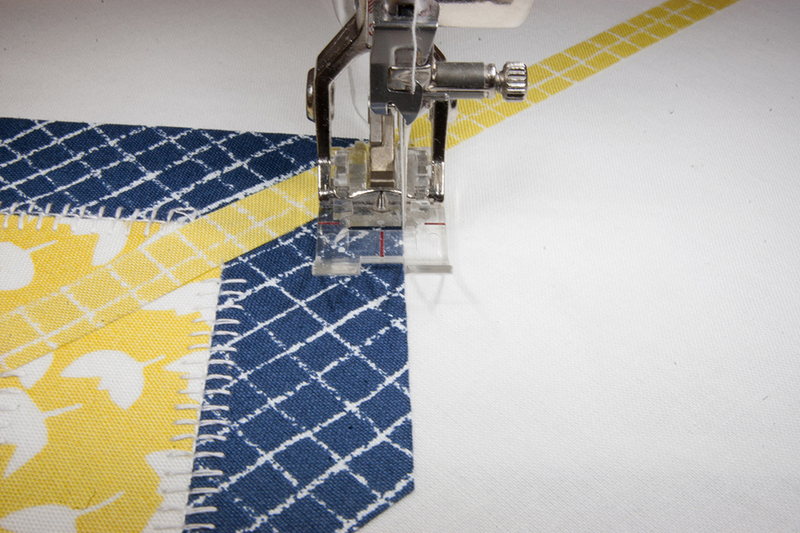 Use your Free Hand System when stitching machine appliqué shapes to help keep your hands on the fabric! 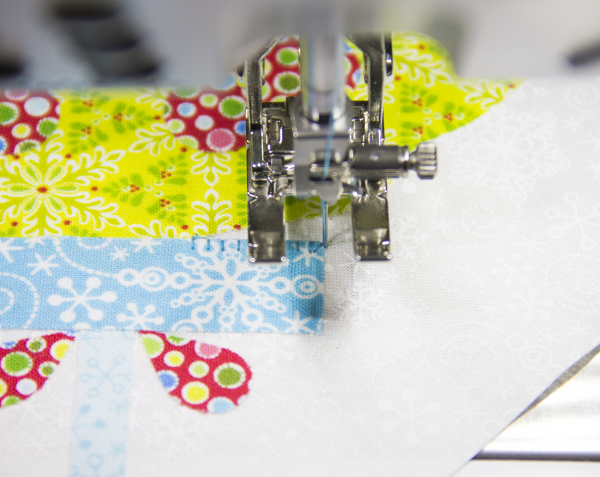 Learn how to use the FHS for more control with your machine appliqué with this tip. 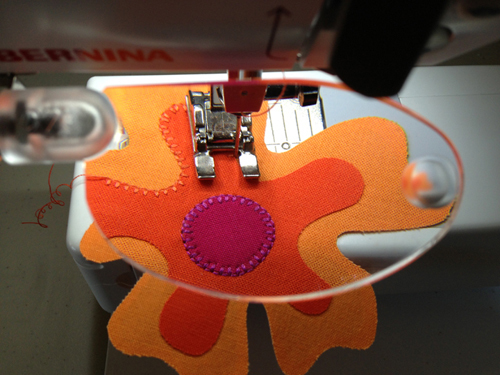 If you need to see clearly where your appliqué stitches are going, try snapping on your Magnifier! 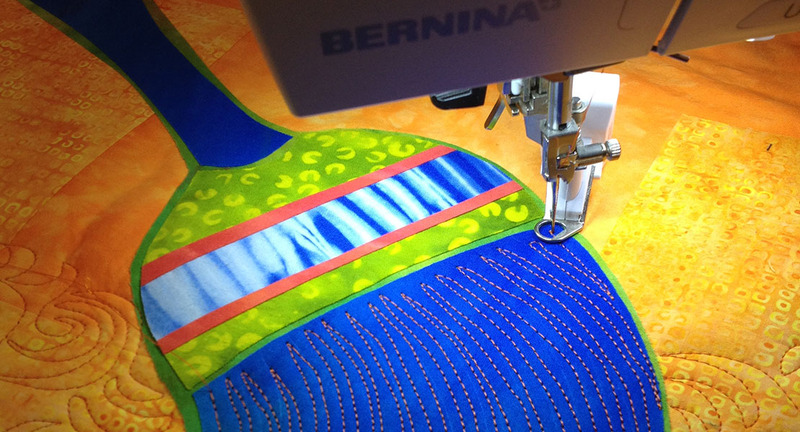 Read all about the BERNINA Magnifier Lens accessory in this appliqué tip. 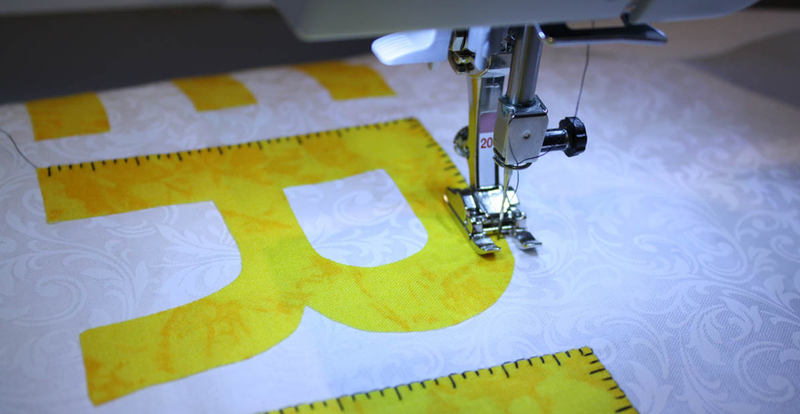 Use this stitch tip to create a fun measuring tape look to your appliqué stitch! Find out how to make a Measuring Tape Stitch in this post. 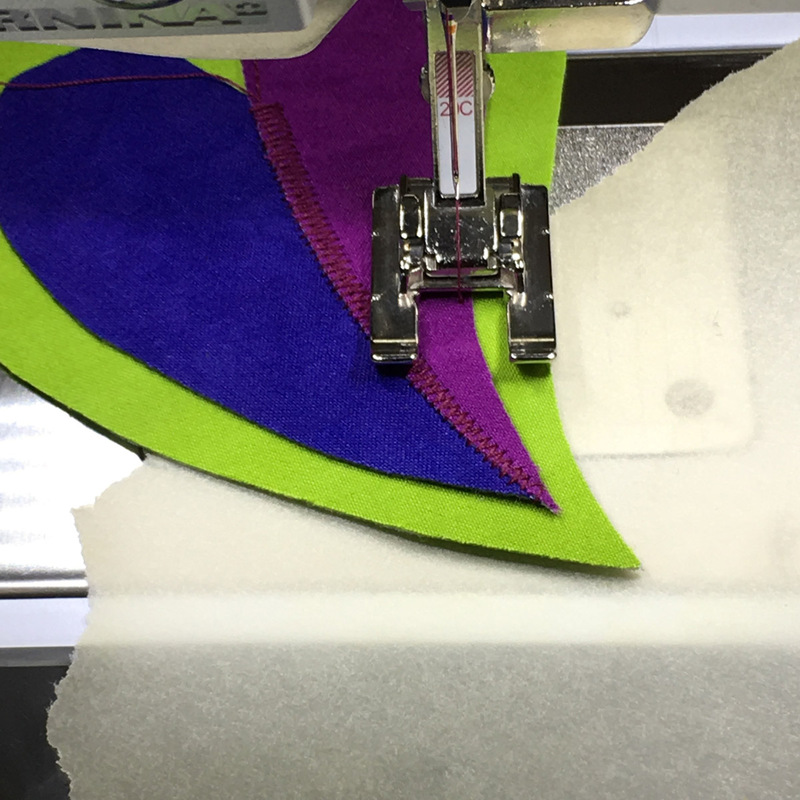 Add a fun pop of color to any blanket stitch appliqué with this simple tip to Embellish the Blanket Stitch! Win an Appliqué Prize Package! One lucky WeAllSew reader will win this set of appliqué tools including one pair of Tula Pink Hardwary Appliqué scissors, one box of appliqué pins, and a handy appliqué pressing sheet! 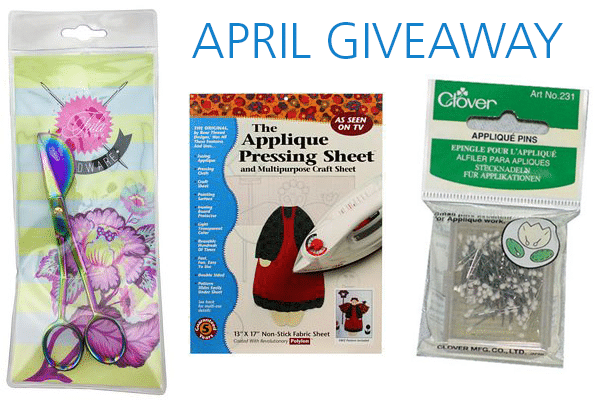 All you have to do is post a comment below and answer the question, “What would you like to make with machine appliqué?” The the giveaway is open through Monday, April 16, 2018! The giveaway is open to residents of the 50 United States and the District of Columbia. One comment per fan. Comment must be submitted to the WeAllSew.com blog by Monday, April 16, 2018 at 11:59 PM Central Time. Winner will be chosen randomly. Winner will be notified by email and will have 48 hours to contact to claim the prize. I would love to do an applique baby blanket for my first great-grandchild that is due in the fall. With my 6th grandchild on the way, I’ll be doing some baby and toddler clothes and bibs in applique! I would love to make some placemats and coaster mugs using applique. Love my Bernina sewing machine. So much good information here! I am trying to expand my skills from just hand applique, to include machine applique. It’s been quite daunting for me, but this blog post will help! What my first machine applique project will be is appliqueing letters onto a newly pieced quilt top. Thanks! A denim jacket with a beautiful flamingo appliqué on the back. I would like to applique a wall hanging with some really cool flowers. Perfect timing. I am sewing appliques onto placemats. This is my first time doing an appliqué, so the timing of these tips is perfect Thank you! I’d like to make some playmat placemats to entertain the kids when we eat at restaurants. I’ve had the materials for what feels like ages but have been too intimidated to get started. This will be a fun project. I would love to do an applique quilt. They are so pretty and something I’ve always wanted to own. I would like to applique blocks for a throw quilt. Applique is a beautiful way to express your ideas. I am interested in making a spring wall hanging! I’d like to make some sort of pictorial quilt. I’d like to make a dresden plate quilt. Just starting a baby quilt with a large elephant applique. Using the freezer paper method so it will not be stiff. The edges are turned under, and still will do a blanket stitch to secure it. Thank you for all of the great examples! I am currently working on Green Tea and Sweet Beans pattern by Jen Kingwell. I have several blocks that I will use raw edge applique. It is a very scrappy quilt with many different techniques. It will be a great learning process along the way. 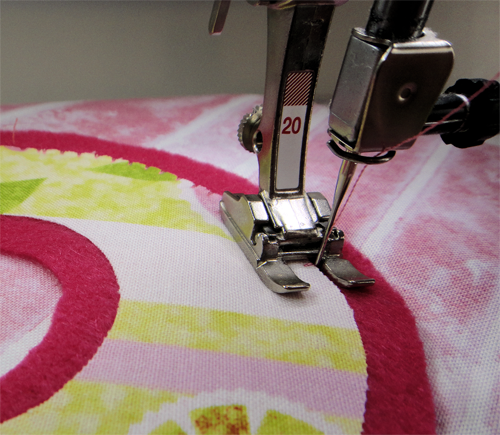 I am still using my Bernina 220 that has a lovely blanket stitch. 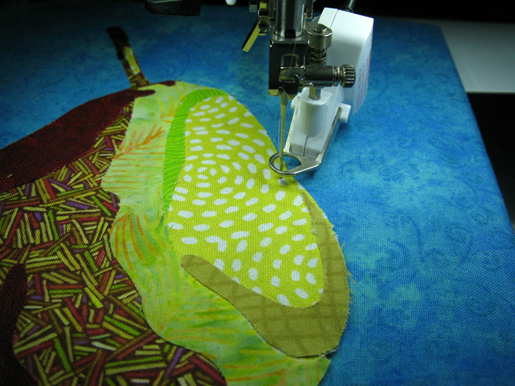 I love to do machine applique. I want to finish my garden applique quilt blocks I’m working on now. I would make a baby quilt for one of my 3 coworkers who are pregnant! A small wallhanging with a flowering landscape design. Thank you for a chance to win these great tools! I Enjoy hand applique. I would like to make a wall quilt for my sewing room. Thank you for the giveaway! Would like to make Lori Holts Bake Shop. Loved all the tips, especially the reference to the ebook on machine applique Just Sew It! I’m making pineapple appliques (the fruit, not the block). I would love to make a quilt with machine appliqué. All the techniques look like fun. Can’t wait to try them out. I’d like to learn appliqué so I can make my good friend Carol an appliqué Baltimore Album quilt that’s as beautiful as she is. I plan to applique some tropical fish…they’ll be bright and colorful. I am new to applique. Have done 2 small projects. One came out ok, 2nd one not so good. I am looking for tips and tools to get more comfortable with the process. I would love to make an Amy Bradley picture. I have the pattern but the appliqué scares me. I will say tho’ that after reading this article I am feeling a lot braver. I have the suggested sewing feet so I should just jump in and do it! I would love to applique’ a center block for a quilt for my cousin. She loves birds and the outdoors so I would use different North American bird embroidery along with flowers and vines that I would applique’. I can see it in my mind’s eye. I would like to make a table cloth filled with hand applique flowers. I would like to use appliqué techniques on my quilts. All great tips but I especially like the idea of embellishing the blanket stitch. I plan on using this idea on a place mat for my 4 yr old grand-daughter – appliqued rainbow and butterflies, her favs. I have always been “afraid” to appliqué. With these instructions I’m sure I can now tackle any project. With three granddaughters, I’m sure there will be plenty of interesting things that can be made. Can’t wait to start laying out a blanket for a dolly with flowers. Thank you so much for this opportunity! I have been considering a Block-of-the-Month Applique Quilt by Bonnie Sullivan but have been unsure of tackling it. This applique package would be a HUGE help and would help boost my confidence enough to take it on! It would be an awesome addition to my “toolkit.” Thanks again for this wonderful opportunity. Bernina ROCKS!!! That is mainly what I do everyday. I love to make appliqué quilts, pillow, table runners and wall hangings and placemats. I use blanket stitch and satin stitch. I use anything from coloring books to my drawings and patterns from BOM’s on line or patterns I find that are versatile. I would applique my whole world if I could, I LOVE IT! Thank you for having giveaways, it makes it even more fun to learn so much! I’d like to start learning applique with a table runner. Large enough project to get Technic but small enough that I can get it finished. I love applique – it is my quilt style of choice. Thanks for the wonderful tips and ebook. Love your blog. Lori Holt’s patterns have quite a bit of appliqué. I’d like to try her technique and use the blanket stitch to stitch around the shapes. My nephew and his wife are expecting baby #2 in Sept. & plan on making a quilt for the little one. I will be using the a pattern that has 4 applique puppies. I would like to applique some zoo animals to placemats and also I just today saw a free online pattern for pansy placemats. I am also working on a multicolored seahorse that needs to be appliqued to a background…there are about 25 pieces in the seahorse! It was a class given by a local quilt teacher. So lots on my list. I would be interested to try the scissors in your prize package as I have always wondered if they really do prevent cutting the wrong fabric. I would love to make a quilt with appliqued flowers and vines throughout the quilt. I would appliqué the background flowers for a basket of three dimensional flowers I have already made. Just need lots of flowers in the background to make the woven basket look lush. I have a project that I haven’t started because I haven’t ever done applique before. It is a floral, spring wallhanging. I would like to try making it using your tutorials. I would love to make a sweet wallhanging with applique, one that welcomes guests to my home. I would like to use that embellished button-hole technique with the Perl cotton. Clever & beautiful! I would like to make a baby quilt using machine appliqué. I feel machine appliqué would stand up to more machine washing. I am making a collage from my father’s ties and want to applique them down. I would like to make a Laura Heine collage art quilt. Probably the bear, maybe the dress form. So many choices! I think applique is fun. I love this site, so much you can learn about applique. I machine applique a lot. I especially like Sarah Vedeler designs with embroidered applique. Great article! I am going to make a Texas Longhorn wall quilt. I will create appliqued baby items. I would like to make bags and applique decorative elements on to them. The circle applique is beautiful, I’d love to incorporate that into quilting! Hi, I bought a pattern that uses machine applique with yo-yos. With this pattern I appliqued a crab with yo-yos on a dress for my graddaughter. I appliqued with yo-yos 3 sea horses on a summer top for my grandaughter. I appliqued with yo-yos, palm trees with a Sun on a beach bag for my daughter. I love all the ideas for applique especially the embellishing the blanket stitch. That could be so fun for an appliqued “mug rug”. I would make a table topper for spring with appliqué flowers and leaves!! I love appliqué…would love to try new techniques, some you described!! Thanks for all the great tips! I would try the applique kitty quilt pattern l saved a while back. I would like to try the Measuring Tape applique stitch. It looks really cute and different! I am making a Dresden plate with floral applique quilt for a niece who lives in Bavaria, Germany and is getting married in late May. I am using the pattern Miss Kyra by Erin Russek. I hope my quilt will turn out as fantastically beautiful as hers did. Thanks for the opportunity. I’ve just started learning applique and I want to make my sister a quilt using the wall flower pattern. I would like to applique a summer themed wall hanging. Making a Christmas appliqué project on pelted for a Christmas challenge. Fused and embellished. Right now I’m thinking about appliqueing on some dishtowels and pot holders to brighten up the kitchen some for spring and summer. Fresh and fun! A college t-shirt quilt for my daughter. I am taking an class using applique. This article is very informative and it would be awesome to win the prize! Great hints to make applique easier. I have a quilt that is just waiting for an appliqued border. This article will help me get this job done. These are all wonderful ideas and reminders. Thank you! While I am a new seamstress and Bernina 530 owner, I would love to learn how to applique the tote bags and accessory items I create! I’d love to appliqué a unicorn on a shirt for my 7 yo daughter, and teach her how to appliqué as well. She’s already sewing on my machine, and I’m looking forward to both of learning the proper way to appliqué together! I have started a baby quilt but have never sewed the applique down. I think I will pull it out and try again after reading the tips. I would love to make a wall hanging with fresh spring flowers. Thanks for all the tips! I would like to try a Shannon Brinkley pattern. Thanks for the giveaway! Although I’ve never done appliqué work on a quilt, I really enjoy using the technique on wall hangings. I would love to transform and personalize a plain T-shirt by decorating it with machine appliques. Anxious to learn more appliqué techniques to apply to clothing for our grandson ! I would like to applique a sewing machine on a quilted sewing machine cover. Think this would be so cute. I would love to learn more about applique! This is so exciting to have all of these tips and to be able to use my Bernina to make more individual projects. The more knowledge I have to add applique to the quilts I make and make them more personal. Working on a quilt for my son that has a hiking theme. Thanks for providing these great ideas. I want to applique a kaléidoscope wall hanging. Thank you for the ebook on Machine Applique! I have always wanted to try and duplicate a picture…dog, cat, fish, etc. I have a quilt kit from my daughter-in-law’s grandmother’s sewing room. It’s a schoolhouse design with eight large pieces for each block! There are NO instructions. I think that I will try the glue method. We are teachers in this family group, so someone will get the quilt when I’m done. Maybe we’ll draw straws! I’d like to repurpose old denim into a messenger bag with appliques on it. These are great tips. I want to applique Amy Bradley’s Campers Quilt! Thanks for the chance to win this awesome prize! Great information. No machine does applique like the Bernina. Love my machine. Nancy P.
I must work on a patriotic wall hanging very soon. Thanks for a great article full of helpful hints! I will be using applique on crazy quilt squares for a new vest. I would like to make a fabric postcard and applique a beautiful flower bouquet on the front. I wanna do something Unicorny for my grand. Have several Laura Heine applique patterns that are so beautiful and look complicated. Bought them to challenge myself one day. These tips on applique would give me more confidence in starting one of her patterns. My daughter wants matching quilts for my 5-year old and 2-year old granddaughters, so I’m planning to applique zoo animals that my daughter has designed. I love applique quilt, now I would like to make a buddha surrounded by flowers wall hanging. A sereine and peaceful quilt to put in my sewing room. I would love to do some machine appliqué on a pieced quilt that I’m making. Thanks for the awesome tutorials. I will definitely try the applique collage art quilt technique. I think it is a great idea for a modern art piece. Great tip on the titanium needles! I really would like to try more raw edge applique. I would love to try all of these techniques! I would like to applique an Adirondack quilt. I really enjoy making art quilts and all these different techniques will help me make them exquisite. Learning something new or different is the spark that starts creativity. I want to applique on a small zipper pouch. I want to appliqué a Christmas quilt. The project I would like to make would be for my sisters. I would like to make a memory quilt for both of them using colorful appliqued things of our growing up years. These will be placed in blank areas opposite pictures. I would love to make an appliqued quilt. Appliqué on cork for a tote. I’d love to make a Baltimore Album quilt with lots of flowers and animals. Thanks for the great giveaway. I would like to applique a wall hanging with flowers and hummingbirds. And maybe a butterfly. I would make an appliqué wall hanging with my hand dyed fabrics. I would like to make an applique scene of my daughter at Walden Pond. It would be using a photo taken where She is looking at Walden’s statue after she put her cell phone in “his hand”. I’ve cut out a large map of the United States using fusible & it’s ready to be appliquéd down on the background fabric for my sweet 6 yr old granddaughter! Would love to win your give-away. I would love to make a tote bag and appliqué flowers on it using my decorative stitches on my Bernina. Great tutorial! I am going to use these techniques to machine appliqué a BOM that began in January but I have been afraid to start – now I have more confidence! I also plan to use the techniques of hand embroidery combined with machine embroidery on a Karen Buckley quilt. I would like to finish an appliqué quilt that I started to hand appliqué years ago but never finished because it seemed overwhelming. I just got the BERNINA Circular embroidery attachment #83 and I can’t wait to use it to appliqué circles onto a colorful art quilt. I’d love to improve my appliqué technique for jackets. What a wonderful way to apply 🙂 interesting patches to holes in clothing, or to apply tailored patches. Fish swimming over the knees of a child’s pants, discrete ersatz pockets over “failed” jeans back pockets, as well as the more fun applications mentioned above. I have in mind two of my favorite tea towels that were “well ironed” and would benefit by some colorful redecoration on their linen faces. I have some animal placemats pictures that I would like to turn into real placemats! One of many UFOs! I am also interested to learn how those scissors with the wing work for applique. Do they really keep one from clipping the wrong fabric? I have always wanted to make a Baltimore style applied quilt ! Thank you so much for the instruction it has helped we with a project I am currently working on. And Thanks so much for the give away ! I would like to make a quilt with applique blocks. I also would like to make a jacket with applique around the sleeves and jacket bottom. I love the look of machine applique. Can’t wait to use my Bernina Tools to improve my skills. I love to applique but only know one way so thank you for giving me some new ideas and pointers. I’m anxious to try these out. Being a first time new grandmother, I’m certain I’ll be delightfully busy. I would love to repair an antique quilt with appliqué stitches. I have a Rose of Rememberance quilt that I’d like to complete with some of these techniques. I would love to make a quilt with lots of appliqued flowers! I would applique for “Mary’s Closet, a Community orginization that donates necessary baby-toddler items from new/ gently used baby clothing, blankets, diapers etc, to families needing these items. I’d like to appliqué on one of my quilts! I made my first quilt by hand. Not one stitch was on a machine. That was about 40 years ago. It is falling apart, I think I would like to “fix” it. I used the blanket stitch on the appliqué. I plan to “fix’ it with my new 770. I’m going to take apart – redo the appliqué with as many decorative stitches I can put on it. Then put back together and quilt it with my machine using my stitch regulator! It will definitely be an update, but all the material (except batting) and the pattern will be the original! I am going to appliqué on the doll clothes that I make for the American Girl Doll. I am going to do a wool wall hanging with my new Bernina. Just did some quilt squares for project Linus and love how easy and nice my machine applique looked. I have an applique glued and ready to be stitched. I just need to get up the nerve to begin. Absolutely love my Bernina. I would love to applique two child quilts for my great grandaughters. I am working on an animal quilt that is all applique for my granddaughter who is turning two on July 29th. 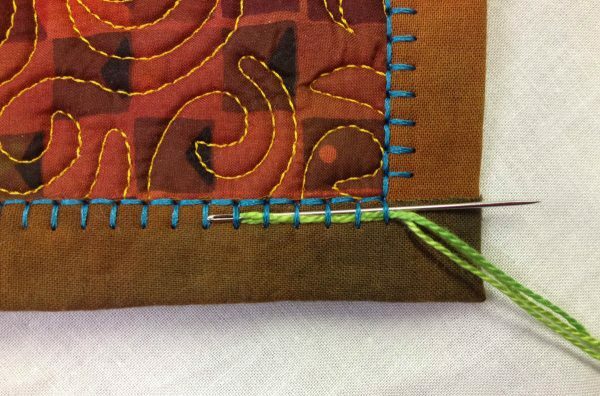 I particularly love using the buttonhole applique stitch. I just completed a “streak of lightning” fence rail quilt and would like to appliqué shadows of birds on a telephone wire across the front of the quilt to match one of the fabrics in the fence rail. i’m making a modern still life with a vase of daffodils and am using machine applique stitches on my 740.